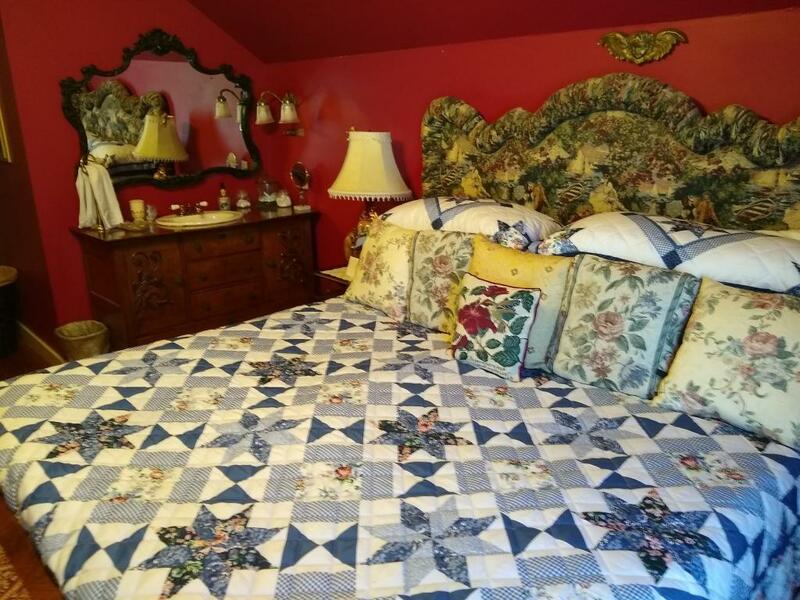 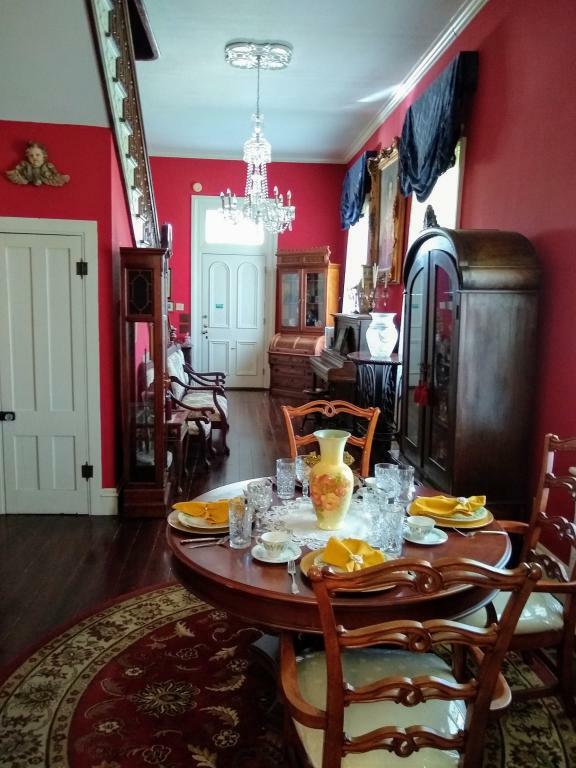 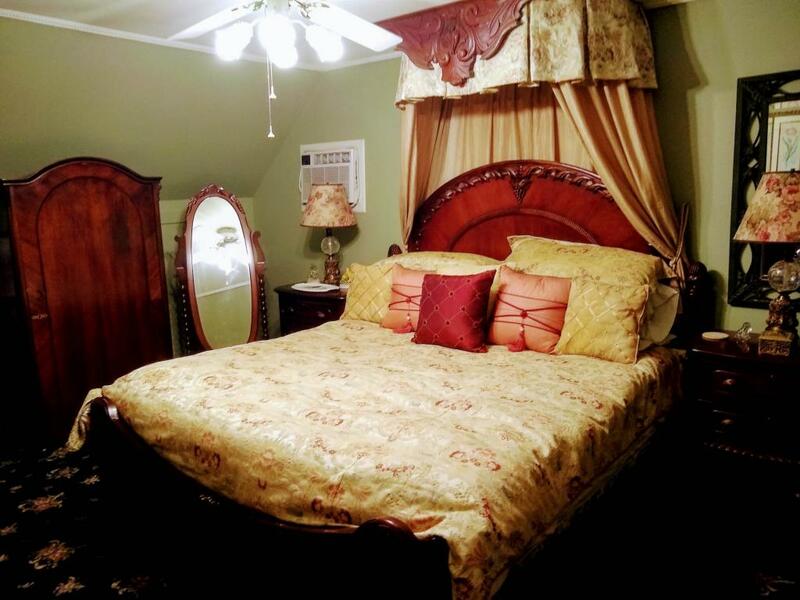 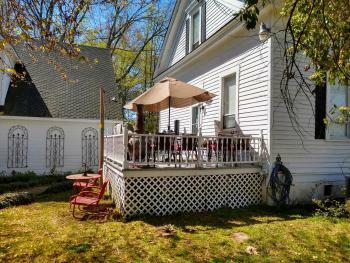 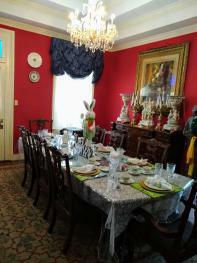 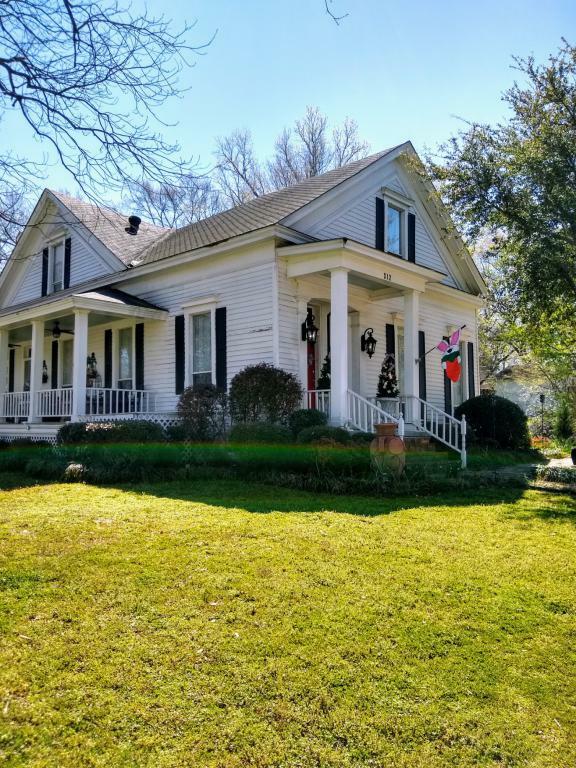 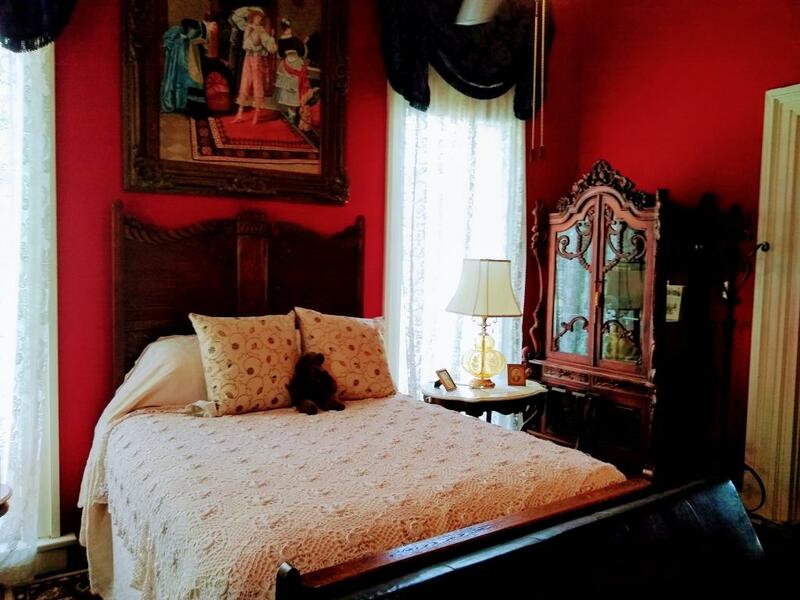 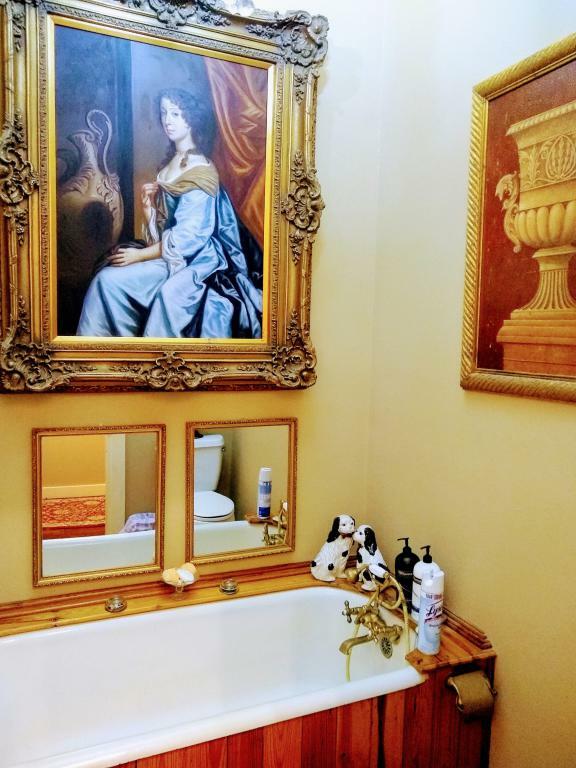 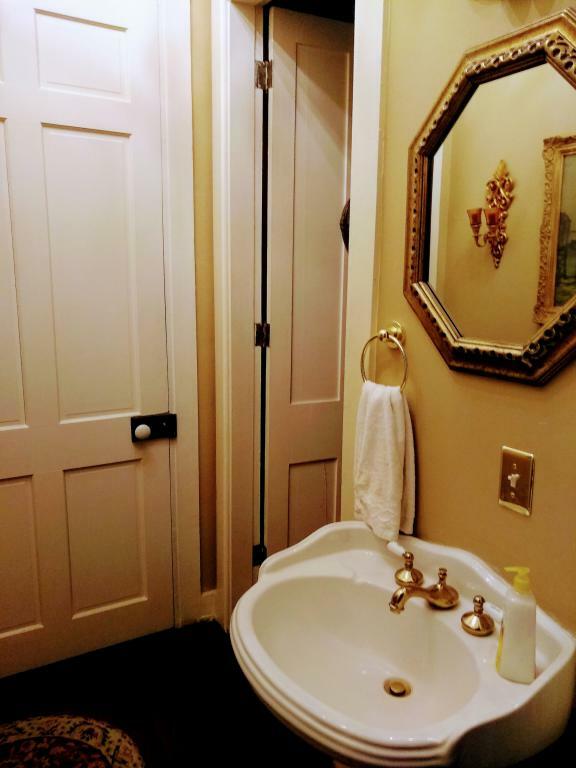 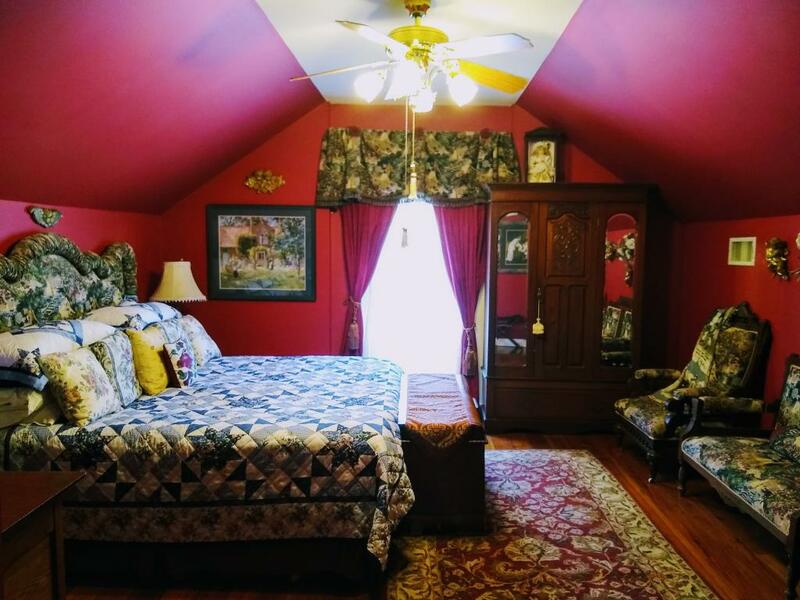 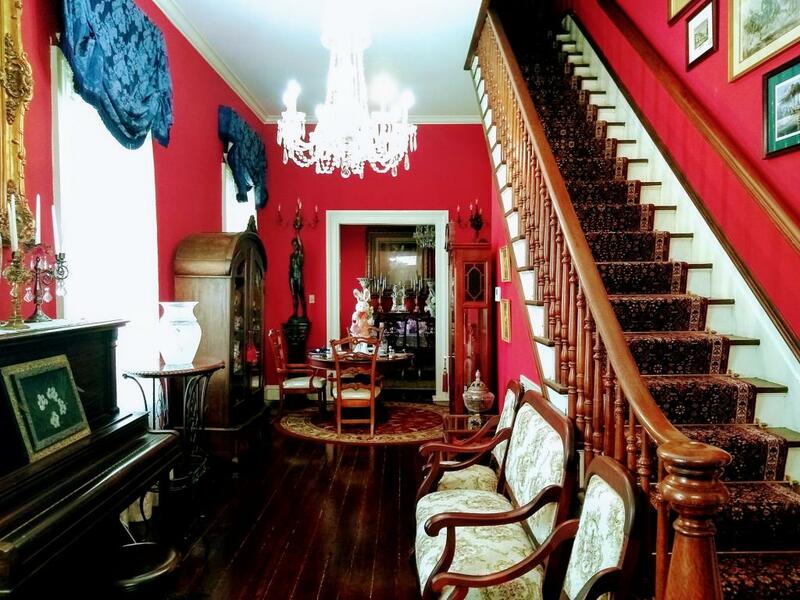 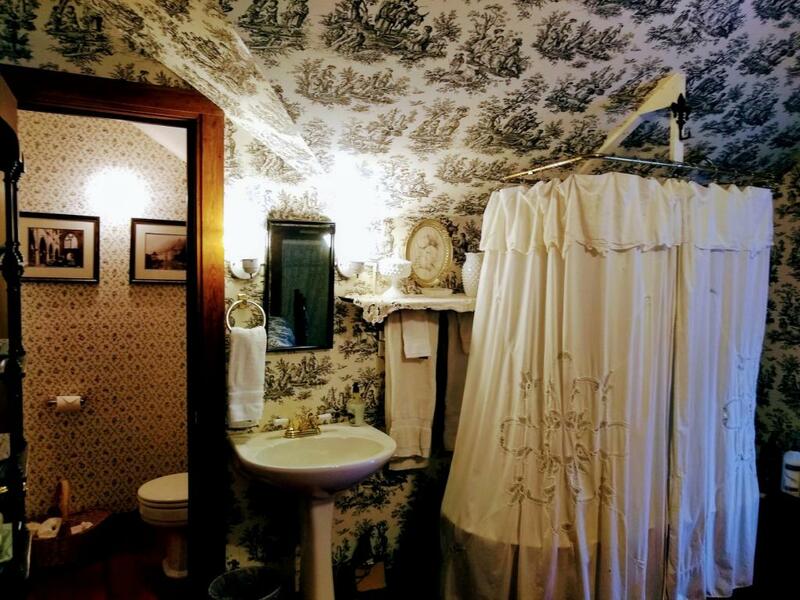 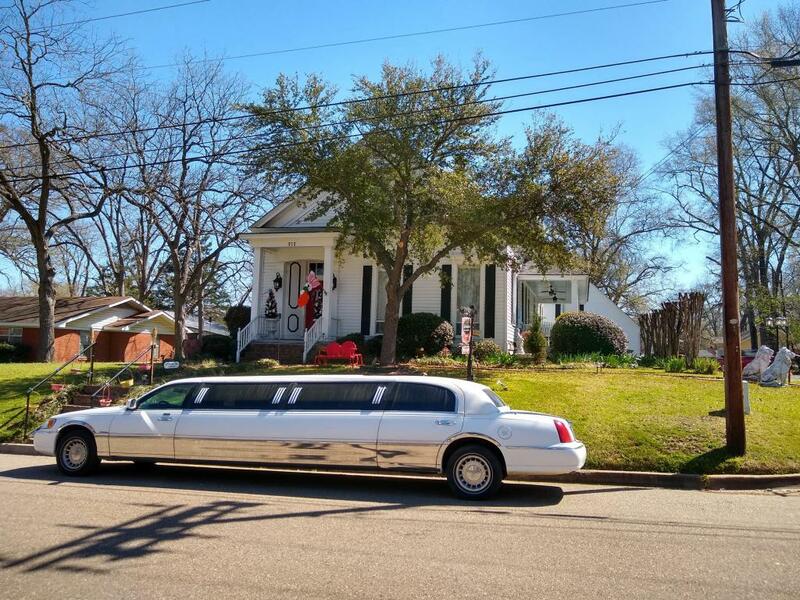 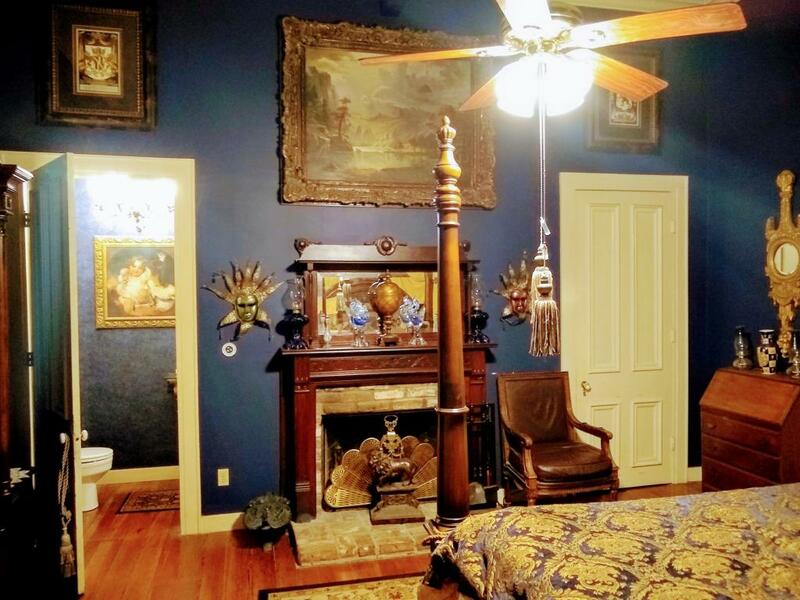 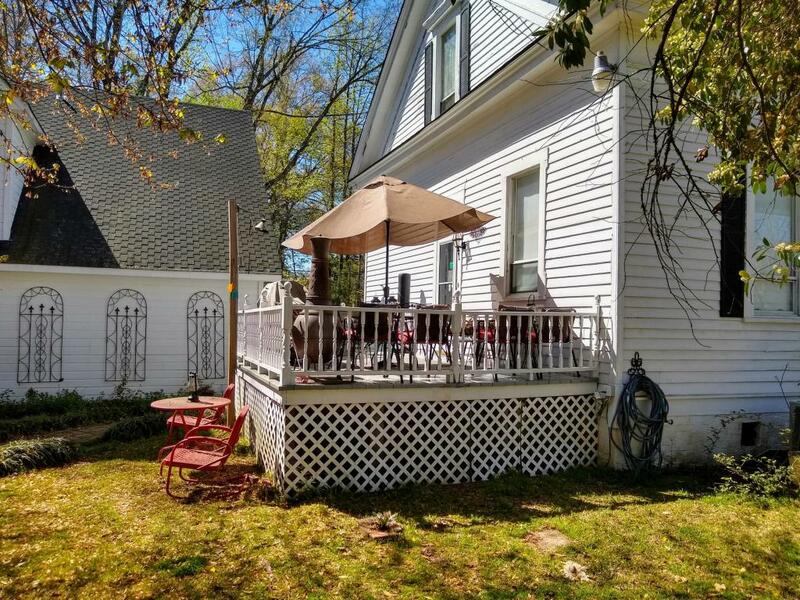 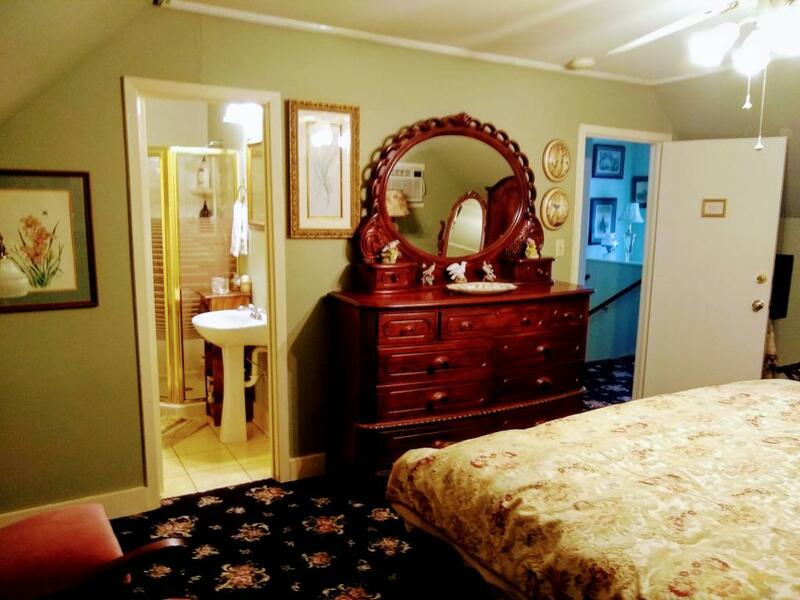 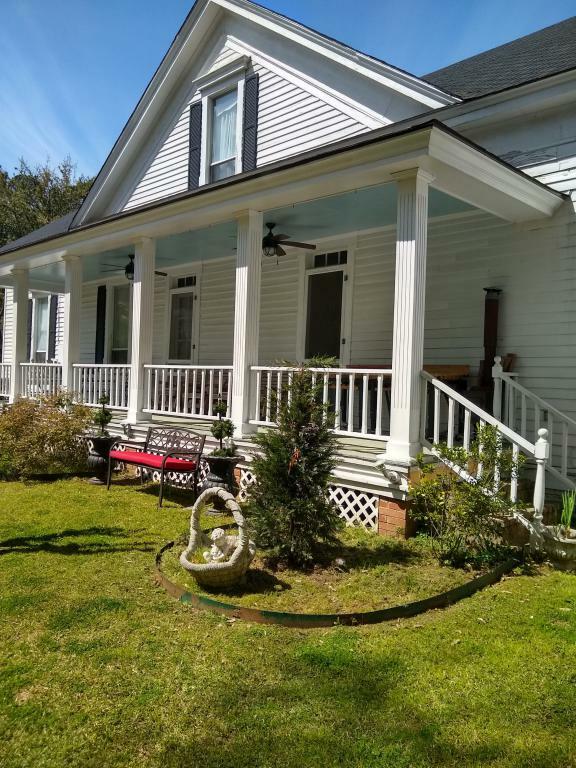 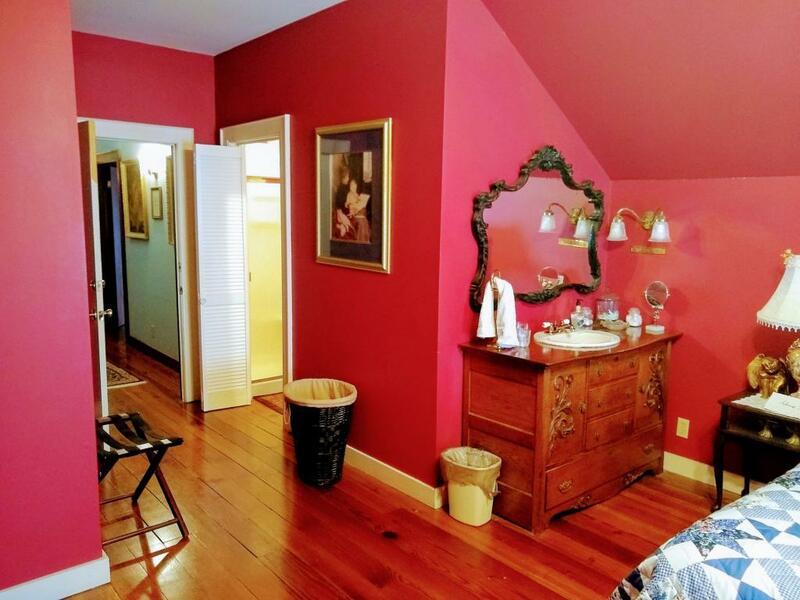 You will find romance in this elegant room with a Jacuzzi tub for two, fireplace, new separate shower for two, private entrance, Roku TV, refrigerator in room, and beautiful antiques from the early 1800's. 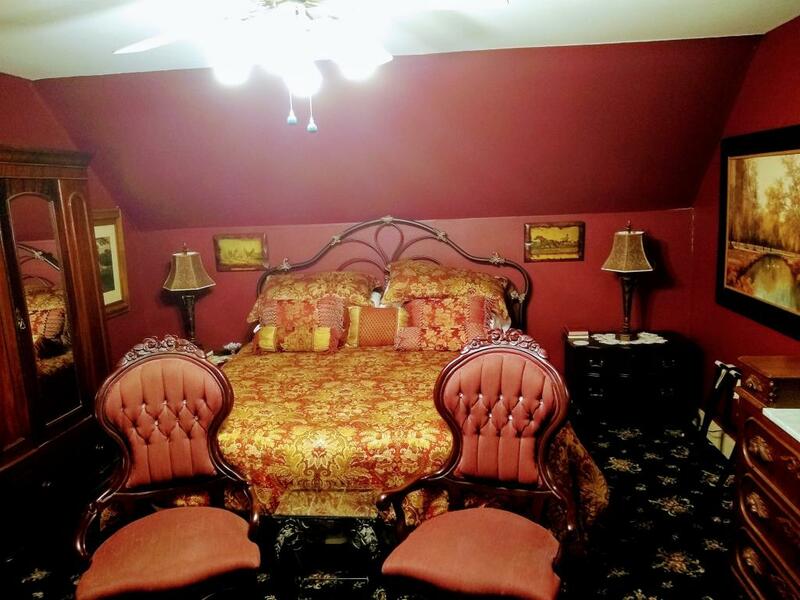 This room has a two-night minimum stay. 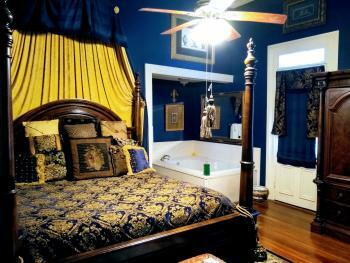 Carriage House Room, King Bed, Antiques in room, shower Decorated in medimum sage green with gold accents. King bed, velvet chairs, Roku TV, and high quality ironed linens. 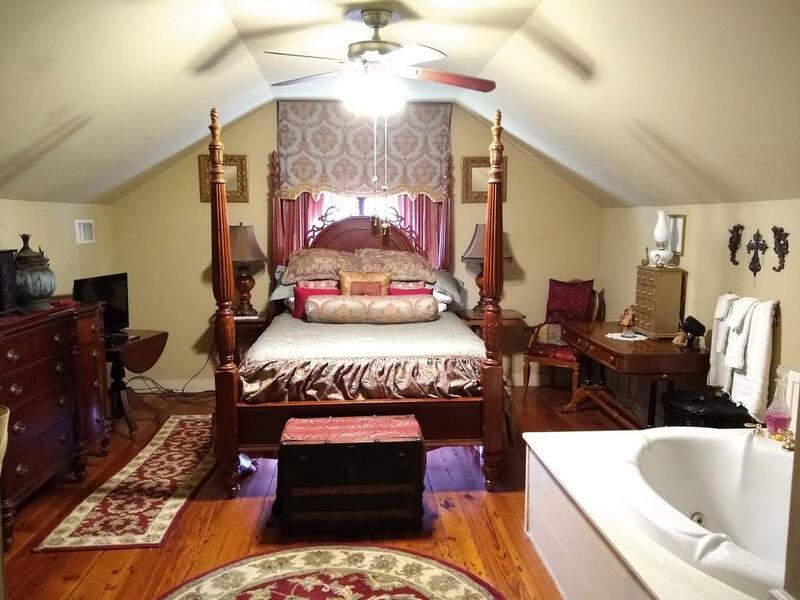 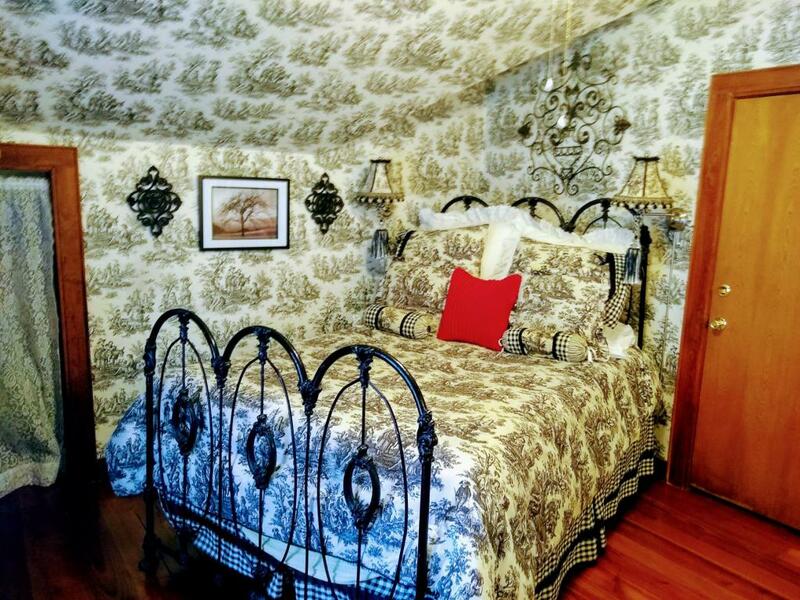 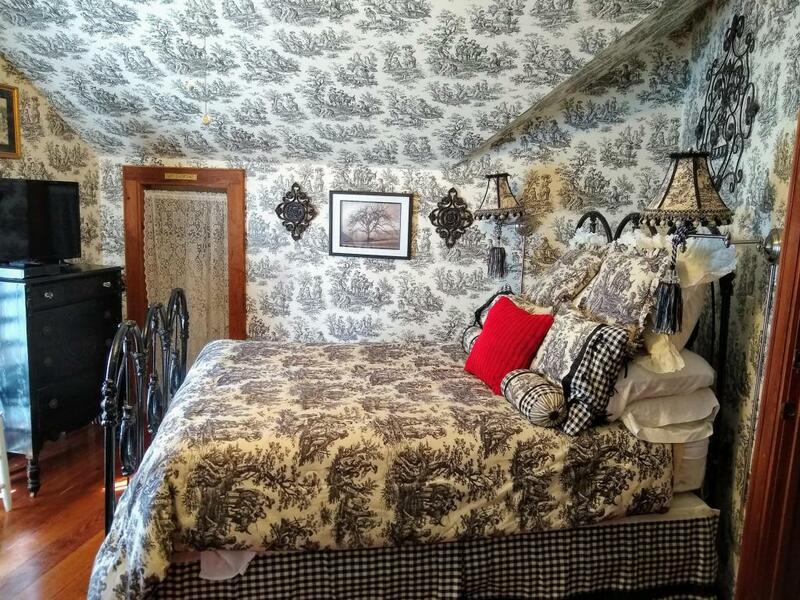 Romantic Carriage House room featuring Jacuzzi tub for two, king size bed, antiques, separate shower in the bathroom, Roku TV, robes to wear, and antique style chairs for sitting. 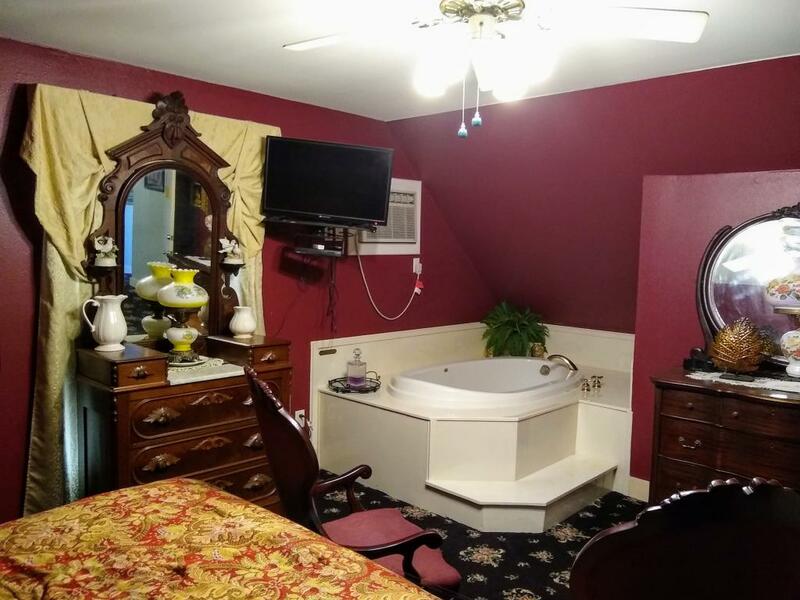 This room is elegantly decorated in wine colors accented in creams. 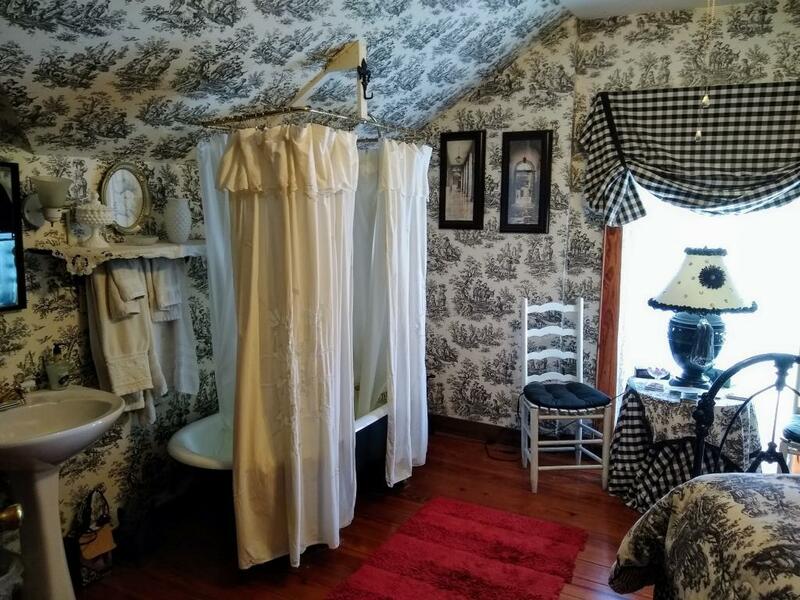 This room has a two-night minimum stay. 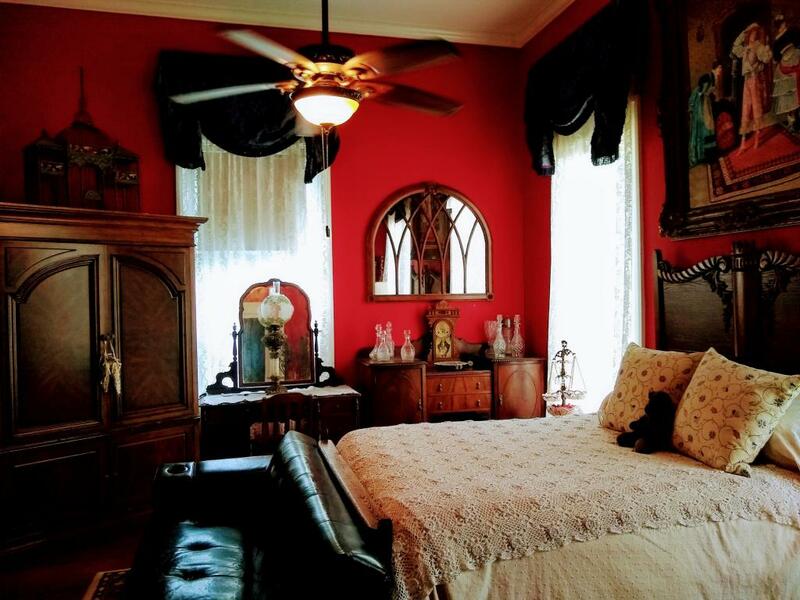 Tennyson features an antique wrought iron queen bed with black and white decorations touched with red accents. 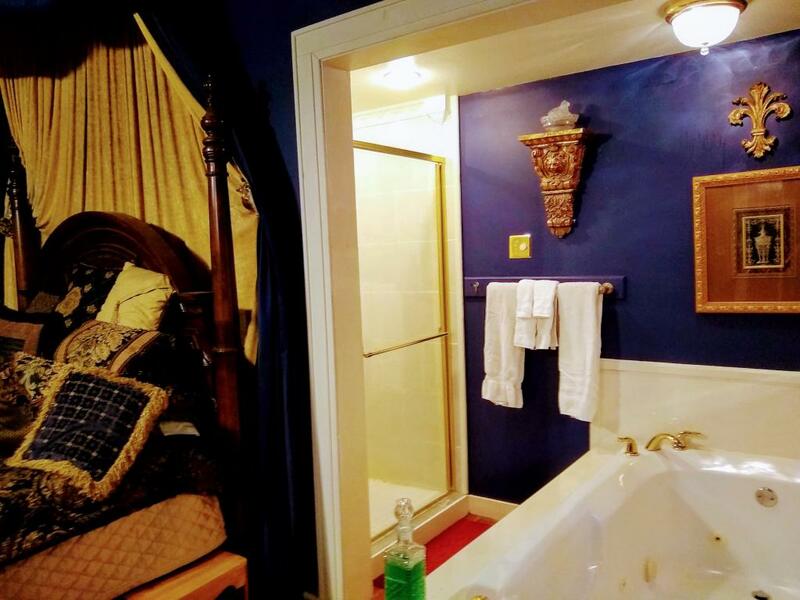 Relax in the clawfoot tub with shower in the room. Robes are also provided for your convenience. 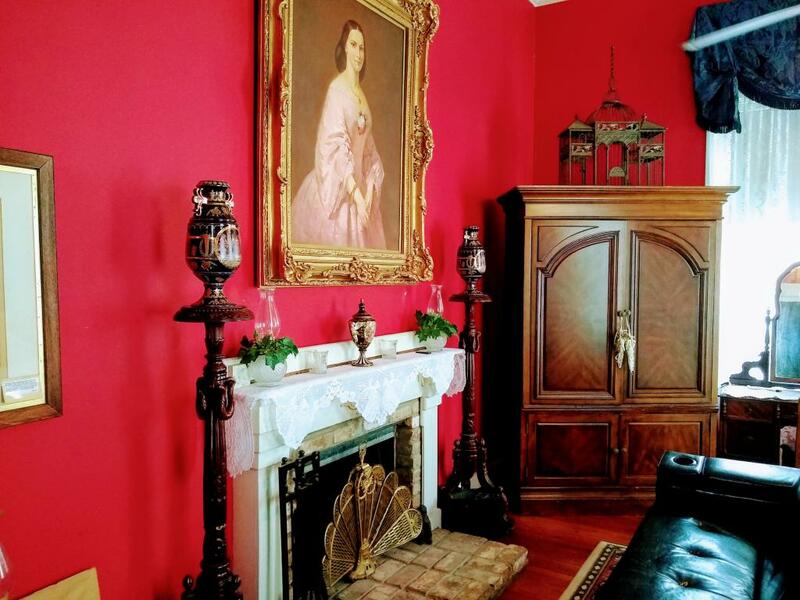 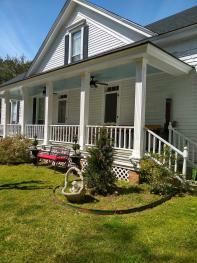 The Francis Thompson room has a fireplace, Roku TV, and features antique furniture throughout. The Queen bed is dated back to the 1850s. 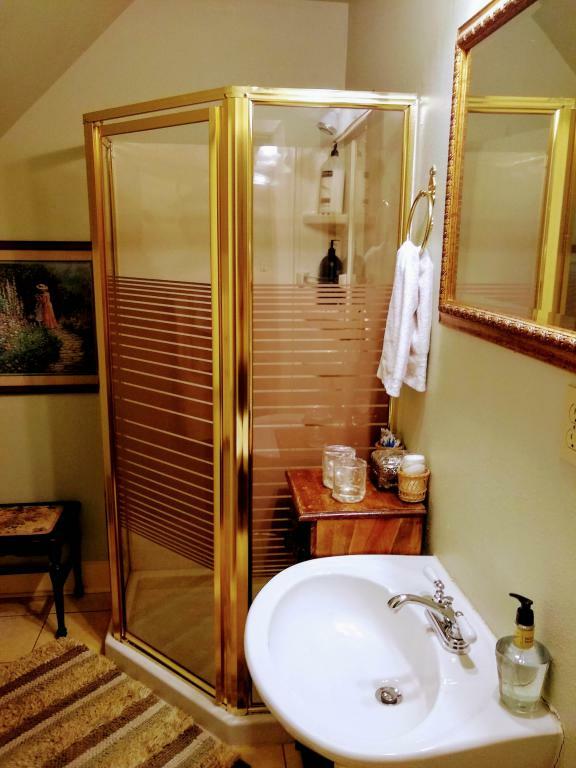 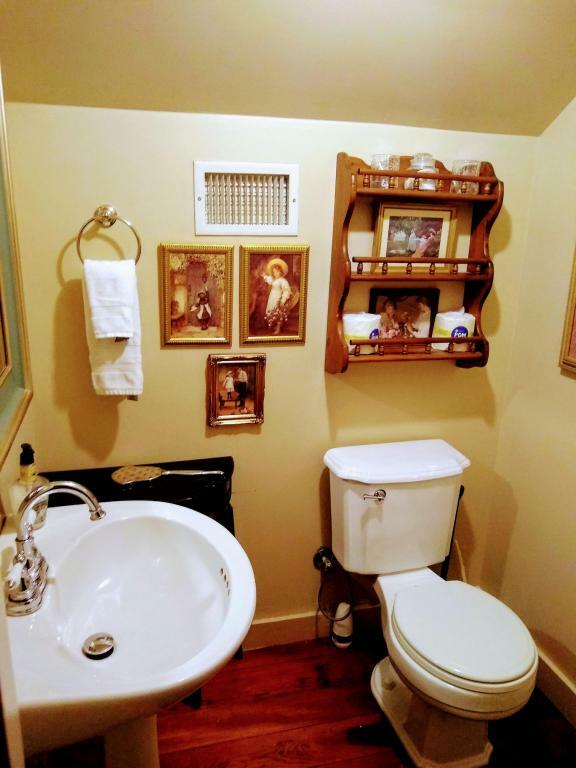 It has a separated bathroom with a claw tub. Main House, upstairs. 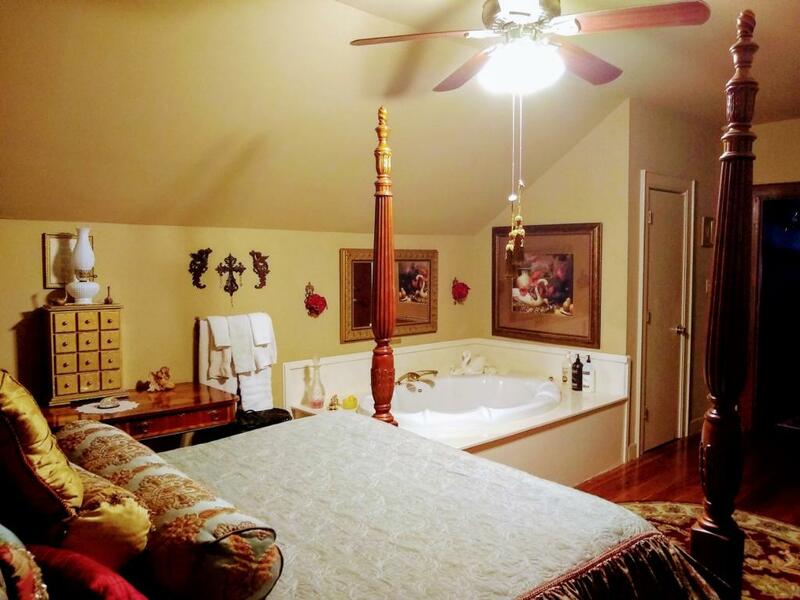 King room & jetted tub Decorated in warm earth tones with splashes of red. 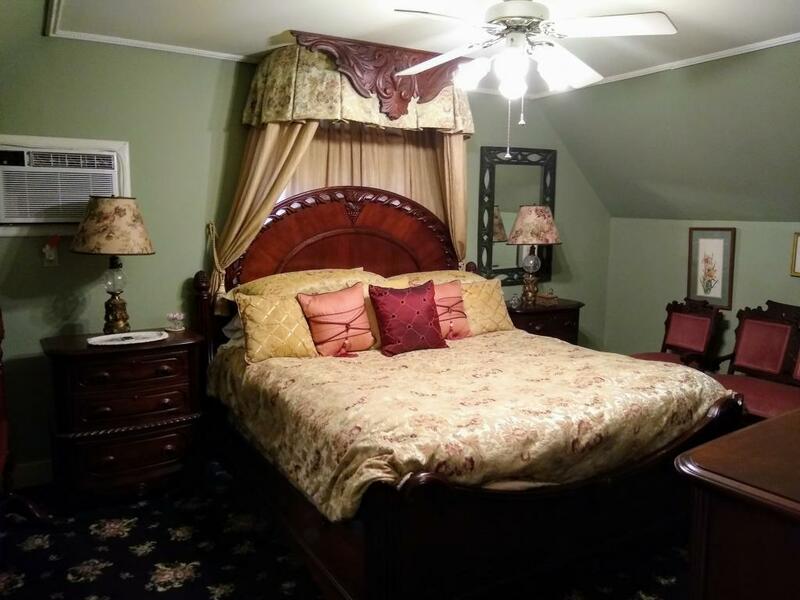 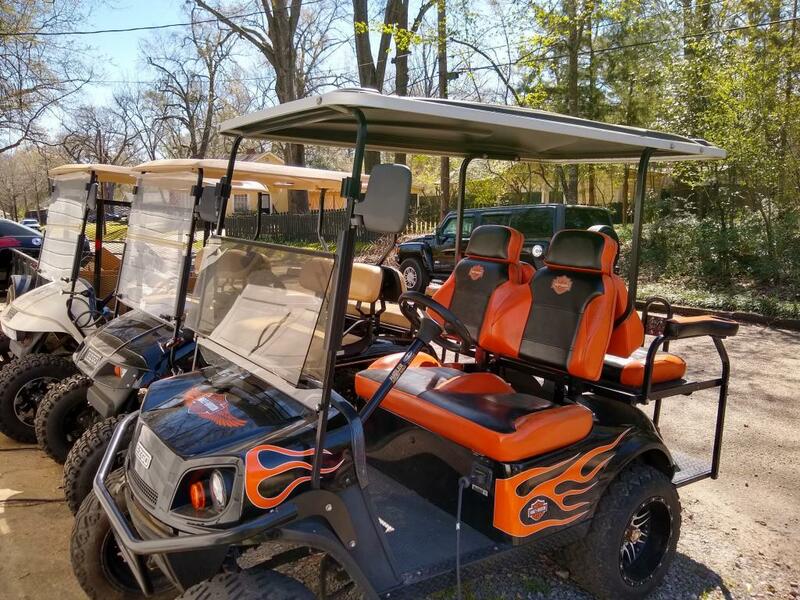 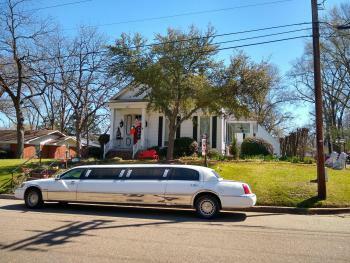 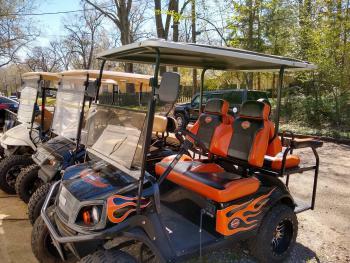 Queen bed, jacuzzi tub for two, Roku TV, high quality ironed linens and Simmons Beautyrest mattress. 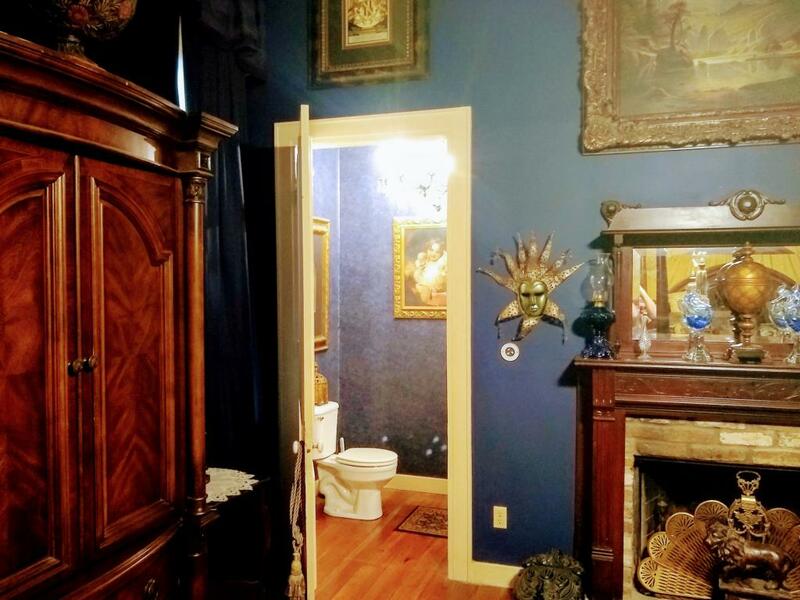 This room has a two-night minimum stay. 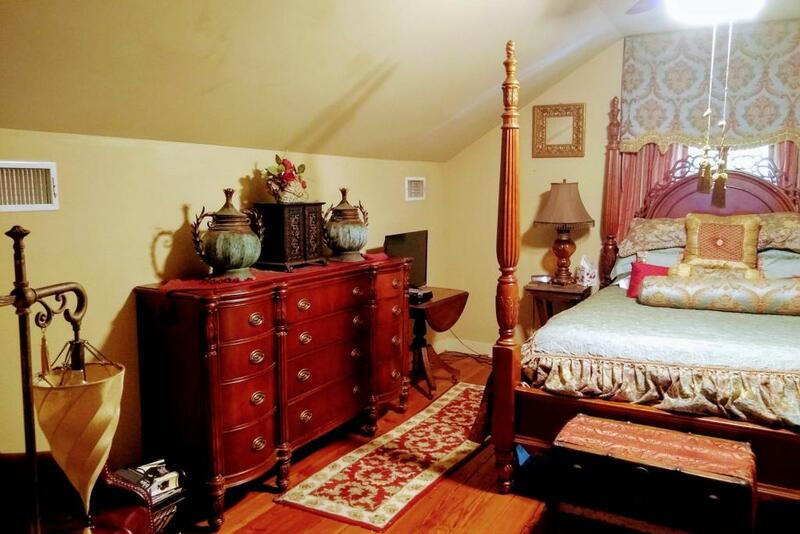 This room features a king size bed, Roku TV, shower in the bath room, Eastlake furniture, original wood floors covered with oriental rugs, and fluffy white robes to wear. 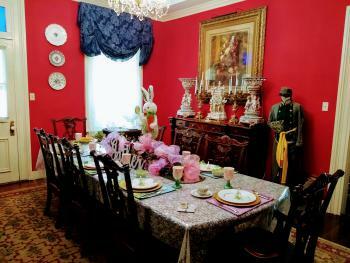 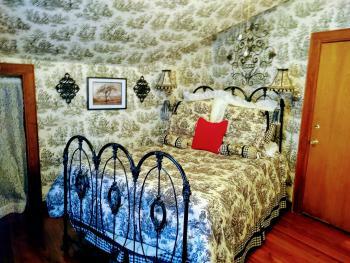 The room is decorated in Burgundy and cream with tapestry fabrics.